Pro-government thugs at Tahrir Square used clubs, machetes, swords and straight razors on Wednesday to try to crush Egypt’s democracy movement, but, for me, the most memorable moment of a sickening day was one of inspiration: watching two women stand up to a mob. I was on Tahrir Square, watching armed young men pour in to scream in support of President Hosni Mubarak and to battle the pro-democracy protesters. Everybody, me included, tried to give them a wide berth, and the bodies of the injured being carried away added to the tension. Then along came two middle-age sisters, Amal and Minna, walking toward the square to join the pro-democracy movement. They had their heads covered in the conservative Muslim style, and they looked timid and frail as thugs surrounded them, jostled them, shouted at them. Yet side by side with the ugliest of humanity, you find the best. The two sisters stood their ground. They explained calmly to the mob why they favored democratic reform and listened patiently to the screams of the pro-Mubarak mob. When the women refused to be cowed, the men lost interest and began to move on — and the two women continued to walk to the center of Tahrir Square. But when I tried to interview them on video, thugs swarmed us again. I appeased the members of the mob by interviewing them (as one polished his razor), and the two sisters managed again to slip away and continue toward the center of Tahrir Square, also known as Liberation Square, to do their part for Egyptian democracy. Thuggery and courage coexisted all day in Tahrir Square, just like that. The events were sometimes presented by the news media as “clashes” between rival factions, but that’s a bit misleading. This was an organized government crackdown, but it relied on armed hoodlums, not on police or army troops. The pro-Mubarak forces arrived in busloads that mysteriously were waved past checkpoints. These forces emerged at the same time in both Alexandria and Cairo, and they seemed to have been briefed to carry the same kinds of signs and scream the same slogans. They singled out foreign journalists, especially camera crews, presumably because they didn’t want their brutality covered. A number of journalists were beaten up, although far and away it was Egyptians who suffered the most. 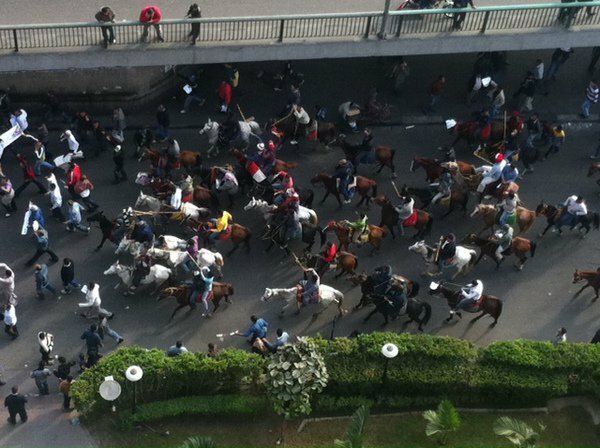 Until the arrival of these thugs, Tahrir Square had been remarkably peaceful, partly because pro-democracy volunteers checked I.D.’s and frisked everyone entering. One man, a suspected police infiltrator, was caught with a gun on Tuesday quite close to me, and I was impressed with the way volunteers disarmed him and dragged him to an army unit — all while forming a protective cordon around him to keep him from being harmed. In contrast, the pro-Mubarak mobs were picking fights. At first, the army kept them away from the pro-democracy crowds, but then the pro-Mubarak thugs charged into the square and began attacking. There is no reliable way of knowing right now how many have been killed and injured in Egypt’s turmoil. Before Wednesday’s violence, Navi Pillay, the United Nations high commissioner for human rights, said the death toll could be as many as 300, but she acknowledged that she was basing that on “unconfirmed” reports. There are some who are missing, including a senior Google official, Wael Ghonim, who supported the democracy activists. On Wednesday, the government said that three more had died and many hundreds were injured; I saw some people who were unmoving and looked severely injured at the least. These figures compare with perhaps more than 100 killed when Iran crushed its pro-democracy movement in 2009 and perhaps 400 to 800 killed in Beijing in 1989. Chinese and Iranian leaders were widely condemned for those atrocities, so shouldn’t Mr. Mubarak merit the same broad condemnation? Come on, President Obama. You owe the democracy protesters being attacked here, and our own history and values, a much more forceful statement deploring this crackdown. It should be increasingly evident that Mr. Mubarak is not the remedy for the instability in Egypt; he is its cause. The road to stability in Egypt requires Mr. Mubarak’s departure, immediately. But for me, when I remember this sickening and bloody day, I’ll conjure not only the brutality that Mr. Mubarak seems to have sponsored but also the courage and grace of those Egyptians who risked their lives as they sought to reclaim their country. 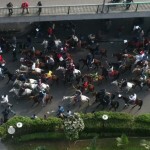 And incredibly, the democracy protesters held their ground all day at Tahrir Square despite this armed onslaught. Above all, I’ll be inspired by those two sisters standing up to Mr. Mubarak’s hoodlums. If they, armed only with their principles, can stand up to Mr. Mubarak’s thuggery, can’t we all do the same? An absorbing communication is worth mention. I conceive that you should create much on this message, it power not be a prejudice human but mostly people are not enough to mouth on specified topics. To the succeeding. Cheers like your Massacre at Tahrir | Nidal Sakr.